Add-ons, Total Recorder - captures any audio from the Internet, records audio from CD, microphone, line-in, converts any sound formats to WAVE file. Phone recording system. Beginning with Version 5.0, Total Recorder provided support for add-on programs. 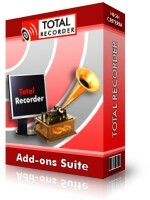 You can enhance Total Recorder's functionality through the use of add-ons. Add-ons are available for you to do the following: restore sound (e.g. enhance the quality of recordings from tape or vinyl), refine speech recordings, accomplish automatic gain control, apply an equalizer, perform mixing functions, and send your recordings to iTunes/iPod. Remove distortions such as clicks, crackles, and background noise, and it provides high-quality restoration of audio recorded LPs, tapes, microphones, etc. Enhance the quality of recording and playback for speech recordings. Transfer audio being played back or captured by Total Recorder over a local network or the Internet in real time. Requires: Total Recorder Professional, VideoPro or Developer Edition Version 8.2 or higher. Display and modify the levels of different sound frequencies. Requires: Total Recorder Professional, VideoPro or Developer Edition Version 7.0 or higher. Adds support for the Ogg Vorbis format. Requires: Windows XP and later, and Total Recorder Standard Edition 7.0 or higher. Requires: Windows XP and later, and Total Recorder Professional, VideoPro or Developer Edition Version 8.2 or higher.